In April 2008 The Church of Jesus Christ of Latter-day Saints announced that they would build their fourth temple in Arizona. The Gilbert Arizona Temple of The Church of Jesus Christ of Latter-day Saints is the 142nd temple worldwide. The temple in Gilbert is the largest that the Church has built in 17 years. It is the tallest building in Gilbert. 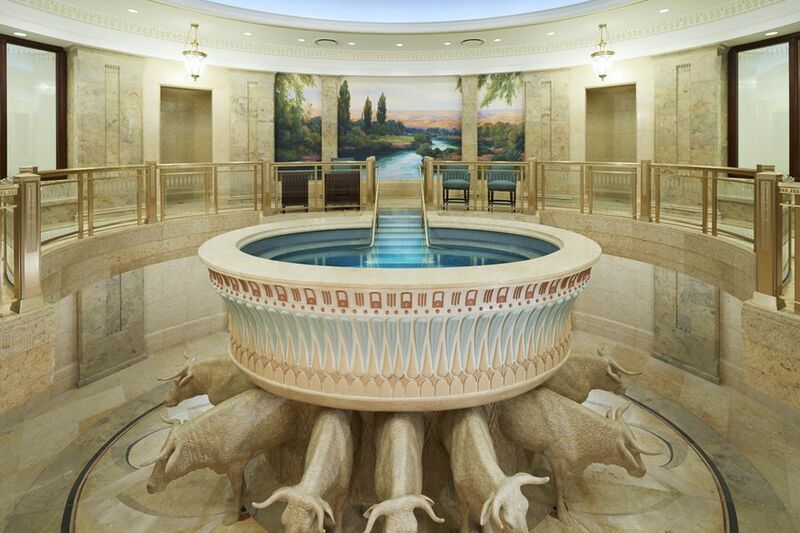 Mormon temples incorporate exquisite detail, beautiful artistry, and are designed with themes that are intended to honor the religion as well as the locale in which the temple is erected. In the case of the Gilbert Temple, a native plant, the agave, was the inspiration for many of the accents and art glass in the building. Visitors were welcomed for a very specific short period of time prior to the dedication of the Temple. Visitors and people of any faith may visit the meetinghouse for worship on Sundays. Factoid #1: You'll notice that there is no cross at the top of the temple spire. That's a statue of the Angel Moroni. There are no crosses inside the temple either, but there are many depictions of the resurrected Jesus Christ. Factoid #2: The art glass is evident from the outside of the front of the temple as well as throughout the temple. Agave leaves, flowers and stalks (century plant) can be seen not only in the blue, green and earth tones of the glass, but also in ceiling, wall and flooring adornment of the interior. Factoid #3: Some of the religious-themed paintings inside the Temple are originals, and some are copies of originals located in other temples. Interspersed with those messages are paintings depicting beautiful Arizona scenic places. Local artists were commissioned for some of the pieces. The Gilbert Temple, unlike the Mesa Temple, does not have a Visitor Center or a Family History Library that is open to the public. Photography is permitted outside the temple. The grounds are lovely, and many people will enjoy the photo opportunity in front of the water feature on the south side of the temple. In May 2008 The Church of Jesus Christ of Latter-day Saints announced the opening their fifth temple in Arizona. It was the 144th operating temple in the world. There were already temples in Mesa, Snowflake and Gila Valley. With Gilbert becoming the 4th Arizona temple, Phoenix would be the fifth Arizona. A new one in Tucson will be added, scheduled to be completed in 2018. According to The Church of Jesus Christ of Latter-day Saints, there are nearly 400,000 Mormons in Arizona (2014). The temple in Phoenix is a single-story building covering 27,423 square feet with a full basement and an 89-foot spire. Mormon temples incorporate exquisite detail, beautiful artistry, and are designed with themes that are intended to honor the religion as well as the locale in which the temple is erected. At the Phoenix Temple, interior design incorporates desert colors with aloe stalk and desert tree motifs. Visitors were welcome for a very specific short period of time. After the dedication of the temple visitors are not permitted. This is standard procedure for LDS temples; only Mormons with recommend cards (evidence that LDS leaders agree with the card holders that they live by the principles established by the Church) may enter a Temple. Visitors and people of any faith may visit the meetinghouse for worship on Sundays. The Phoenix Temple, unlike the Mesa Temple, does not have a Visitor Center or a Family History Library that is open to the public. This Temple will not hold community events, like the Easter Pageant or Christmas event in Mesa. Get addresses and driving directions to all three LDS temples in the Phoenix area. Fish, Butterflies and More, Oh My! How Far is It to Drive From Mesa to ...?